Now that the Glazers' plans for a partial flotation of Manchester United on the Singapore stock exchange have been confirmed, here are a few more observations. The club and its bankers are briefing journalists that some of the proceeds from the IPO will be used to repay some of the club's debt. The Telegraph even suggests that the family have realised that the debt burden is hampering the club's ability to compete in the transfer market. David Cairns MP: "There can’t be any ambivalence about this. Obviously it would be much better if Man United was not carrying those levels of debt and servicing them, surely?" David Gill: "In isolation, yes, but there is no issue in terms of asking whether Manchester United has been hampered in terms of what we have had to do as a club in respect of investing, as you quite rightly say, in facilities, players or player contracts. I personally believe that there has been no impact in that respect." How much will the IPO raise? The BBC suggest between £400m and £600m. How much of this will actually be used to pay down the club's debt? Will we have to wait for the prospectus, expected to be published in six to eight weeks time. To make a real difference to the cash flow, a substantial amount would need to be paid down, £200m+. Debt repayment reduces the interest bill but increases the corporation tax bill so this will have an impact too. What will the club's policy on dividends be? This is crucial as paying down debt and reducing the £45m interest bill doesn't improve the club's financial position if interest payments are just replaced by dividend payments. The club does not have to pay dividends post flotation, but twenty eight of the the thirty companies in Singapores's Straits Times Index (the "STI", the equivalent of the FTSE) do. The STI yields over 3%. If United had a market capitalisation of (say) £1.2bn, and yielded 3%, that's an annual dividend bill of around £36m. When considering the success of the IPO, its impact on the club and whether fans can or should invest once the shares are listed, valuation is key. I apologise if what follows gets a little technical. When I wrote about valuation in my post on Wednesday I compared a suggested EV/EBITDA multiple for United of over 21x (on the basis of no debt repayment) to the 14.6x paid for Stan Kroenke for Arsenal. Whilst United may or may not deserve a premium valuation to Arsenal (and you have to ask which club has the most upside in improving its commercial operations in the future), it is worth noting the Kroenke was paying for control of AFC in a contested situation. In such circumstances one would expect to pay a premium price. The United IPO will be an offering of minority position, a very different situation. I thought it might be useful to look at possible valuations in various scenarios. Using some IPO proceeds to repay at least some of the club's debt impacts on valuation itself when looking at measures using "enterprise value" (i.e. debt plus equity). What is in effect happening is that debt is being swapped for equity. The briefing to the press has suggested the Glazers are looking to raise £400-600m, a huge range. I have assumed 2010/11 EBITDA of £110m (we will know the exact figure in October). It is worth noting that 2010/11 was a very good year on the pitch and the media income earned from winning the league and reaching the Champions League final cannot be assumed to recur in the future! 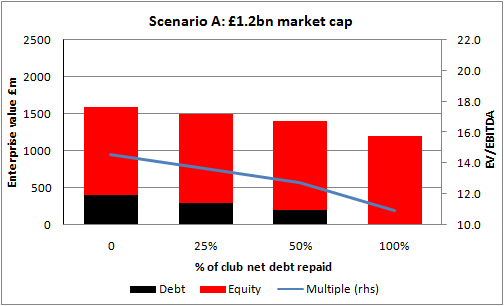 The charts below show the EV/EBITDA valuation in two scenarios, a flotation of 1/3 of the club for £400m and for £600m and how various levels of debt repayment impact the valuation. I have deliberately kept the scales constant. In Scenario A above, 1/3 of the club is sold for £400m, implying a market capitalisation of £1.2bn. If all the proceeds are used to repay the £400m of net debt, the club is debt free, has an enterprise value of £1.2bn or around 11x 2010/11 EBITDA. By contrast if only 25% (£100m) of the net debt is repaid, the enterprise value is £1.5bn or 13.6x EBITDA. 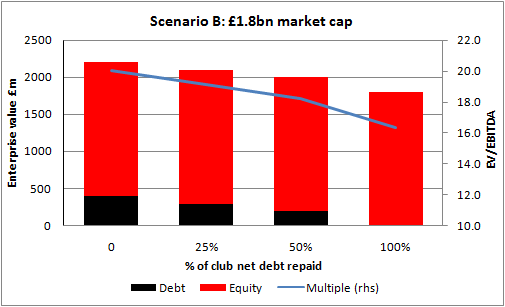 Scenario B above shows the same process but at a far higher IPO price with 1/3 of the club sold for £600m, giving a market capitalisation of £1.8bn. In this scenario, even if all the debt is redeemed, the EV/EBITDA multiple is still 16.4x and if only £100m is repaid, it's a very punchy 19.1x. As I have said before, EBITDA is not a particularly good measure of a football club's profitability. Below EBITDA comes transfer spending which can be very significant. In 2010/11, net transfer spending equalled 30% of EBITDA. A more rigorous valuation method is to look at free cash-flow after transfers and capex. Assuming annual net spend on players and infrastructure of £35m, unlevered free cash-flow is around £65m (assuming only £3m of cash tax is paid, a low rate than cannot be relied on indefinitely). DCFs are notoriously bad predictors of value, but a simple two stage model growing free cash at 10% per annum to 2015, then 5% to 2021 with 3% perpetuity growth and a 9% discount rate gives an EV of £1.5bn (so a market cap around £1.2-1.3bn assuming some debt is left in place). If that sort of growth rate only justifies a valuation at the lower end of the range, the higher prices mooted rely on some very heroic assumptions. There will no doubt be further twists and turns in this story in the weeks to come. I will endeavour to keep readers up to date. Readers will no doubt have seen the story, initially reported by Reuters’ International Financing Review news service yesterday, that the Glazers are planning to float a minority stake in Manchester United on the Singapore stock exchange (the "SGX") later this year. This story follows rumours in recent months of a listing in Hong Kong. What could it mean for the club? The first thing to say is that we have few details to go on. IFR mentions a “$1bn” listing, around £600m. How much of the club that would represent depends on the valuation on flotation the Glazers could achieve. Suggestions in the media that £600m could be raised with the Glazers only selling around 30-35% would indicate a very high valuation in excess of 21x EBITDA. By comparison, Stan Kroenke’s acquisition of Arsenal earlier this year was at a valuation of around 14.6x EBITDA and Fenway paid 11.4x EBITDA for Liverpool in 2010. The suggested United numbers may of course be bankers’ puff, but they are certainly aggressive. The second obvious statement to make is that actions the Glazers take are generally for the good of the Glazers and nobody else. It is notable that neither the club nor the family have made any attempt to consider supporter involvement in any flotation. Information is, as usual, very scarce. 1. What will the Glazers would do with the proceeds of an IPO? One obvious answer is to pay down some of the club’s £400m (net) debt, the bonds issued in 2010. That would, without question, be good for the club, reducing the interest bill (currently around £45m per annum) and freeing up more cash to invest in the club. The other answer, and in my view far more plausible, is that the cash will go to Florida to bolster the Glazers’ personal finances. As has been well documented, the Glazers obtained £249.1m (c. $400m) from an unknown source in November 2010 to repay the infamous PIKs. I have it on good authority that this money was borrowed. The family’s highly leveraged US strip malls business, First Allied, continues to struggle. In 2013, NFL teams will have to meet a wage “floor” which will (on current figures) reduce the profitability of the notoriously low spending Tampa Bay Buccaneers. All in all, the family could do with a significant injection of cash. It seems logical that the flotation plan is really just the “Plan B” adopted by the family after they decided (in the face of the green and gold protests) not to use United’s cash to deal with the PIKs (for evidence of this fear of supporters see this Bloomberg article from October 2010). With the club's cash pile not available, a minority IPO is the logical next choice to get the Glazers out of their financial hole. If I am right and the Glazers are intending just to take some personal profits, there will be little short-term impact on United’s finances, although the club's dividend policy may change. The club would not be obliged to pay dividends after flotation, but there is a risk that further cash would have to leave the club under the new structure. On the flip-side, if an IPO relieves the financial pressure on the family, the risk of them taking dividends out (which they are already able to do) is reduced. Once again we need more information. 2. Should supporters try/want to buy shares? Looking back, many fans realise that we missed our chance between 1991 and 2005 to build a meaningful supporters’ stake in Manchester United when it was listed on the London Stock Exchange. Leaving ownership to City institutions led to the Sky bid, the manipulation of the club by Magnier and McManus and eventually the Glazer takeover. A flotation of United, even in Singapore, gives an opportunity to own shares in our football club again and that cannot be dismissed out of hand. The problem is of course that any supporter stake would be as a minority in a Glazer controlled business. With the suggested valuation so high the sums needed for a meaningful stake look very difficult to achieve. Despite these issues, I think as details emerge, we should as supporters look very carefully at this new opportunity. A minority sale is a major change in approach by the Glazers and looks likely to be the beginning of the process of them selling the club (although this may take some years). If that is the case, supporters need to be thinking now about how they can be part of a new ownership structure. The sheer size of Manchester United may appear to preclude any major stake for fans, but in some ways the scale of our support provides the opportunity. MUST have 172,000 registered “e-members”, the club claims 330m “fans”. Looking at those two numbers, could 1 million supporters be brought together in the next twelve months and commit to invest £100 each? That would be a significant toe hold. A great first step on the way to greater supporter involvement in years to come. 3. What should we do now? In the short-term, we all need more information on what the Glazers are planning. How much will they sell, to whom, when, what will the board structure be, what will the dividend policy be, how long will the family’s remaining stake be “locked up” etc, etc, etc. Without this information we can only talk in generalities. As these facts come out, I passionately believe we need to achieve some new unity amongst our support. MUST will, as the mass membership official supporters trust, take the lead, but we need to try and build a consensus with all groups including IMUSA, the three fanzines, principal forums, FCUM (who remain part of the family), and possibly members of the “Red Knights” consortium and groups like Stretford End Flags and others who some feel haven’t been sufficiently “anti” in recent years. It may be that none of the numbers stack up when we see them. It may be that unity is not possible, but we screwed up our last opportunity to get meaningful supporter ownership in our club and we would be wrong not to look at this opportunity closely. Together. United. 1. 21x EBITDA calculated as follows: Estimated 2010/11 EBITDA £110m. £600m for 30% of equity implies equity valuation of £2bn. Current net debt (outstanding bonds less cash at bank) c. £400m. Enterprise value therefore £2bn + £400m = £2.4bn or 21.8x EBITDA.